Fireboy and Watergirl are almost like brother and sister to each-other, except they are two very different characters. 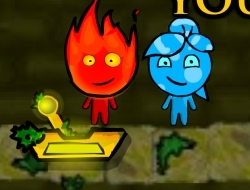 Fireboy on one hand has the power to cross lava and very hot places without even breaking a sweat because of his very high body temperature, whilst on the other hand, Watergirl cant cross those or she will evaporate, but she can go through water like a professional swimmer, whereas Fireboy would just have his flames put out. Control them in rounds and try to figure out how they should handle each situation, seeing which one of them you should go first with, to allow the other one to follow closely behind. Fire Boy and Water Girl 3 9.00 between 0 and 10 based on 2 votes.